In an age of screens, avatars and online anonymity, David Rosenberg and Frauke Requardt’s latest collaboration performs an intriguing reversal. The Roof, which is part of the London international festival of theatre, explodes the video game out of the screen and into the open air. In a car park opposite the National Theatre, audiences are invited to look on as a three-dimensional hero runs, jumps and fights his way through level after level. Virtual meets real. Surprisingly, neither Rosenberg nor Requardt are big gamers. The concept of gaming as a structural and visual reference point emerged from the idea of an audience inhabiting a single character at the same time as being able to observe that character’s actions from an external perspective – the relationship between gamer and avatar, essentially. The resulting show is, according to Rosenberg, “a bit of an out-of-body experience”, in which audiences invest in an avatar whose movements they have no control over. This unsettling dual experience is created through the use of headphones and binaural technology, harnessing immersive sound to transport audiences to the heart of the action. But while each audience member is offered an individualised, isolated experience through the soundtrack being pumped into their ears, Rosenberg and Requardt insist that it is vital to observe the piece as a group. “We want to create an environment where the audience feel that they’re part of a mob and there is something gladiatorial about the perspective that they have on the action,” says Rosenberg. As a group, spectators can watch, but not intervene. “We never set out to create an interactive experience where an audience can determine an outcome,” Rosenberg explains. He compares the helpless experience of both inhabiting and watching a character to how we live our lives “through a collection of mainly random events and attempt to attach our own agency onto those events”. As Rosenberg and Requardt discuss, the clear parallels between gaming and life – progression, growth, levels – invite an audience to draw such connections. “We were interested in taking the structure from gaming because the structure holds the audience through the show,” Requardt adds, suggesting that the “predictability” of this structure helps to give shape to a piece which relies more on movement than on words. Layered over this simple logic, Requardt’s choreography has been able to access a more abstract language, exploring “existential things about what it’s like to be alive”. Despite this abstraction, Rosenberg and Requardt are also interested in some of the concerns particular to gaming – violence chief among them. 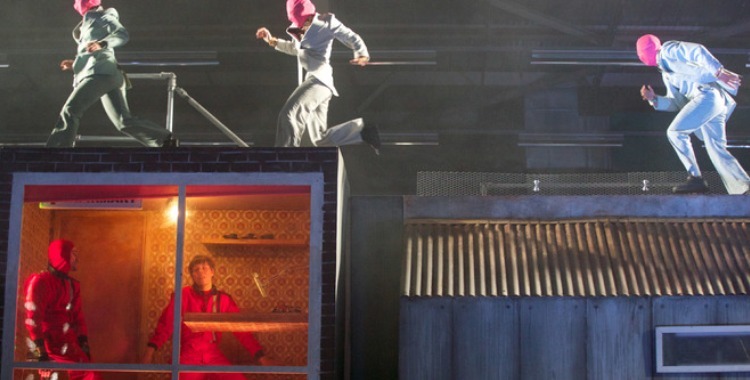 The Roof may not explicitly address this issue, but Requardt believes that “there’s a question about violence which is raised, just because it’s a live performance and it’s not a game”. The implications of this might have as much to say about the culture from which those games arise as the games themselves. After all, as Rosenberg reflects, “there aren’t many video games where you get rewarded for altruism or empathy”.